The B-17 aircraft, designed by Boeing Aircraft in 1934, is one of the most famous aircraft ever built. The B-17 prototype first flew on July 28, 1935 and first went into combat in the Philippines and Hawaii on December 7, 1941 in strikes against the Japanese fleet. Eventually the B-17s were used in every theater of operation in WW II, but were best known for daylight strategic bombing of German industrial targets. When production of the B-17 was halted in May 1945, a total of 12,731 aircraft had been produced. In Europe alone, B-17s dropped more than 640,000 tons of bombs – which was almost 200,000 tons more then were released by all other Allied bombers and fighters combined. The ”Flying Fortress” earned its name in aerial combat over Europe with an average of 25 enemy planes shot down per 1,000 sorties. It became legendary for sustaining heavy battle damage and still being able to return to base. 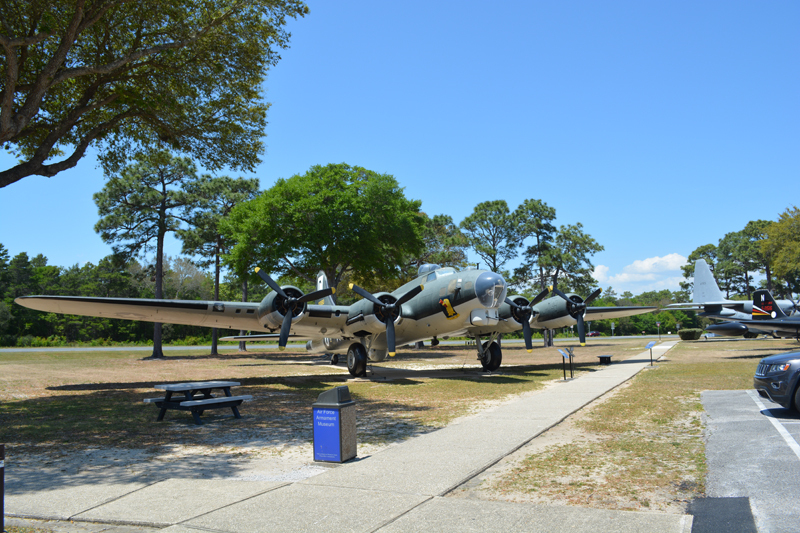 This B-17G S/N 44-83863 was built in 05 July 1945 for the USAAF, transferred to the US Navy on 14 July 1945, sold on 02 December 1957 for use as a forest fire tanker, traded back to the USAF Museum in 1976. It is being depicted with the 96th Bombardment Group (BG) emblem, the 96th BG would later become the 96th Test Wing (TW) on July 18, 2012. The 96th Test Wing is Eglin AFB,FL.